Do you have frequent headaches, earaches, tender jaw muscles or a dull, aching facial pain? Does your jaw lock or stray to one side when you open your mouth? These aches and pains may be related to the jaw joint, called the temporomandibular (tem-PORO-man-DIB-u-lar) joint or "TMJ," and the muscles that work to move the joint. When the source of these problems is this joint or its muscles, they are often referred to as "TMD" for temporomandibular disorders. • jaw joints that feel as if they are "locked," "stuck" or they "go out"
To determine how best to treat your TMD, a complete evaluation is recommended. Your dentist may check the joints and muscles for tenderness, clicking, popping or difficulty moving. Your complete medical history may be reviewed, so it is important to keep your dental office record up-to-date about your health even though you may not think it has anything to do with your teeth. Your dentist may take X-rays of your teeth, jaw or TMJ, and may make a model of your teeth to see how your bite fits together. The joints and muscles on each side of your jaw work to open and close the mouth. These joints move in many different directions to give you the range of motion needed to chew, talk and swallow. The two temporomandibular joints are among the most complex joints in the body. 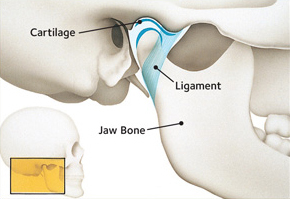 They work together in a delicate balance with muscles, ligaments, cartilage and your jaw bones. Pain can result when these parts don't work together properly. For some patients, the disorders may disappear by themselves; for others, they may come and go, or may worsen over time. TMD disorders are often managed, rather than cured. Your general dentist may recommend treatment, or refer you to a physician or dental specialist. There are a number of ways in which TMD may be managed. Success likely will require you and your dentist working together to find what the approach that relieve your symptoms. Treatment may involve a series of steps. The step-by-step plan will allow you to try simple treatment before moving on to something that is more involved. 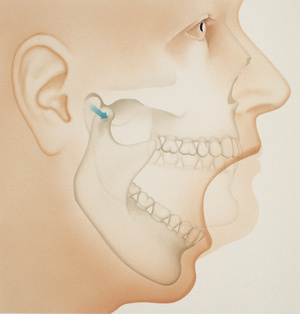 Experts generally recommend a "less is often best" approach to treating TMJ disorders. This means that the simplest treatment that provides you with pain relief may be the best for you.